I don’t always agree with Thomas Friedman, but it’s hard to argue with someone who has won 3 Pulitzer prizes and countless journalistic accolades in a respected career. In his latest book, “Thank You for Being Late,” he gets far more right than in any of his previous works and gives society a powerful and timely assessment of our current world and its rapidly-accelerating pace, change and technological advancement. Friedman is known for taking complex topics like the global economy, climate change, politics and ethics and breaking them down into easy-to-understand recommendations for improving our world. He is one of many writers for the New York Times that challenges me and makes me think about my own biases and long-held beliefs. In this book, however, we couldn’t agree more. 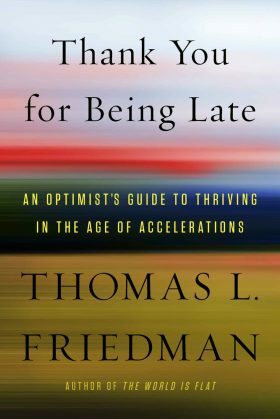 In a world where computing power has accelerated so quickly and large swaths of our economy and society are being uprooted and drastically changed, Friedman offers a way to think about our place in the midst of all of this change and how to pause and appreciate both the opportunities and challenges in front of us. Friedman says one of his jobs over the years has been to translate English into English. It’s a cute observation, even for him, and it would be obnoxious for any lesser-qualified writer to make such a bold statement. In this book, however, Friedman deserves such a bragging right. If you want to hear a brilliant assessment on how to think about the rapidly-accelerating world in which we live and especially if you want to hear an opinion unlike anything you see on broadcast news, this book is a wonderful place to start.